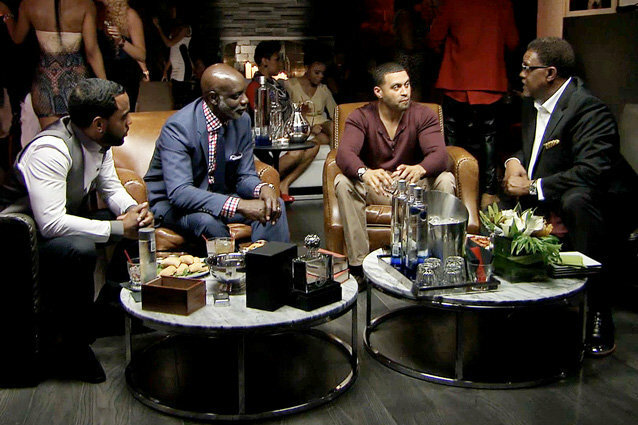 If you’ve been curious if misogyny is still alive in Atlanta, how much producers can squeeze from Atlanta footage, and what Bar One looks like full of patrons, your questions get answered in this week’s “episode” of Real Housewives of Atlanta. What better way to close out a season full of fights than with four of the husbands getting sloshed and hawking Ciroc vodka? They seem way more forthcoming with the truth and don’t really worry about embarrassing their wives. After a lot of unnecessarily formal footage of the men “arriving” at Bar One aka For Lease, they all grab some drinks and start dishing. Poor Apollo. He’s deadling with charges of bank fraud and his future is still up in the air… with his wife. Apollo shares intimate details of his marriage including a night he was slapped awake by Phaedra Parks. Apparently, she chose the middle of the night to rehash all of the issues they’ve faced all season. He also admitted they’re in counseling. He was pretty forthcoming about his problems with the relationship. It can be hard to enter a marriage when you aren’t on equal footing. The special does put him in a different light. He seems sympathetic. He’s just a simple guy who is hot as hell. The producers also air some shots of him coming home and trying to be lovey dovey with his wife but dealing with drama. How is he as a husband? He’s not perfect and the jury is still out on whether he and Kenya Moore had something going on but he does seem like a good husband. As if yelling at his wife like he is going to hit her isn’t enough of a clue, Peter Thomas tries to prove he’s a misogynist. He spends the entire episode talking about how much of a man he is, what it means to be a man, and man this man that. The only thing he doesn’t seem capable of saying is the letter “S.” It must stand for sloshed because he’s a generally well-spoken man but definitely has trouble speaking. He doesn’t reveal much new information. He addresses how he is entitled to speak out and be opinionated which is yet another poke at the “Peter is a b**ch” debate. How is he as a husband? Despite his issues with money, he’s also really full of himself and obsessed with being macho. His bravado kills a lot of his appeal. Todd Tucker: Will They Do It on a Boat? Will They do It with a Coat? If you had any doubts that Todd Tucker and Kandi Burruss like to get it on, they were quelled by this episode. They do it in the car, in restaurants, with toys. Todd also seems really suited for Kandi. He’s got the same amount of savvy, humor, and honesty. He throws out a lot of questions to the guys and feels like the host, which feels forced. He definitely bows his head to the married gentlemen and takes their advice. How is he as a husband? He seems real and authentic. He shares not wearing a Rolex Kandi gave him because he was hesitant. He seems like he’s genuinely in love and a good guy. Gregg does reveal a fair amount of charm this episode. He generally a quiet guy which makes sense given how outspoken NeNe Leakes can be. He gives a couple of funny lines and responses to everyone. He seems like an attentive husband. However, given NeNe’s questionable behavior lately and rumors of her firing what will become of Gregg. He talks but doesn’t really say much of note other than how much he takes care of NeNe. How is he as a husband? Gregg didn’t do much this episode but he does seem like a great fit for NeNe. He’s the yin to her very vocal, outspoken yang. He also seems like an attentive househusband. “All our wife is independent woman, all our wife feel they could exist without us. So if you don’t establish that I’m the man right out the gate, like he’s saying, and it comes later it’s a problem.” – Peter butchering feminism… and the English language.